After a week with no updates, no, we haven't died! Though fresh news has, it seems. We'll try and have some new reviews up soon, to fill the gap. Though for now, check out some of SNK's cool updates. 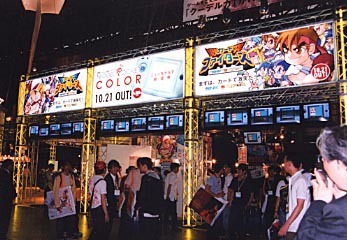 Like TGS Autumn '99 photos, and their SNK vs. Capcom section, which has been updated with a bunch of images, info, even some nice fanarts. 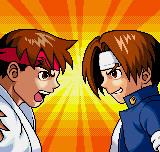 A Preview of SNK vs. Capcom (fighting version) has been added to the Games section. It features new, slightly higher quality screens, and some info. Is there anyone that ISN'T looking forward to this game?! 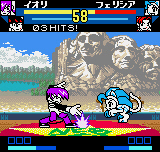 ...SNK announces a new Neo Geo Pocket. Yes, another one. Well...maybe. European trade paper, CTW, has revealed that SNK is developing a 32-bit Neo Geo Pocket system, intended to go head to head with Nintendo's Gameboy Advance. This news comes as no surprise, but I'm sure we would all hate to see SNK shift focus from the NGPC, right when things are really picking up. Though, since nothing else is known (or has even been officially announced by SNK of Japan) at this time, we'll reserve judgment. Thanks to Magic Box for the info. The Coming Soon section has been updates with a few new dates and corrections (such as Pocket Lover Neo's official name change). More [interesting] updates will made tomorrow, as time allows. NGPC...going where no handheld has gone before! Magic Box has reported some very interesting news from Japan...SNK is currently developing a special kit that will allow users to connection their NGP to the Internet (via PC). What will you do once online with your system? Send and receive E-Mail, download special features and "patches," and even play networked games against other players! Does this sound awesome or what?! The Games section has been updated with a new Biomotor Unitron FAQ (English version) by none other than Kelvin Koh, and a review of Namco's Pacman, by F.M., has also been added. Sector: NGP reader, Wilson, has submitted a Review of Sacnoth's masterful Dive Alert, which despite network troubles is online and ready for action! Though it was officially revealed last month, in-game shots are now available, and thus a Preview of "Faselei!," Sacnoth's latest simRPG project has been added to the Games section. It's looking cool, it's from Sacnoth, and it's coming this November. Sounds great already! Thanks to our DS buddy fluX for informing us of the new images. Woo hoo! It's great to see more Action/Platformers showing up. Now all we need is a shooter! We're assuming that Tournament Puroresu is actually ADK's Battle Royal under a new name, though we aren't sure yet. substance J just hit SNK's Japanese NGP homepage, and found brand-new, official images of all "New! Neo Geo Pocket" housings (shown below)! Slick shells, attractive ¥6800 price, and loads of potentially killer games, all on one day. This could provide a sizable boost for SNK in Japan. SNK vs. Capcom ~ Battle of the Strongest Fighters (shown above, to be released in December) is looking hot, and will be packed with different modes of play. Singles, KOF-style 3 on 3 Elimination, Capcom-style 2 on 2 Tag Team, survival, and "Olympic Mode." No idea what Olympic Mode is, but we've got our fingers crossed for a sort of Story or Making mode. 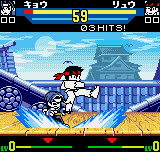 Also from GodMars Sky...images of the New Neo Geo Pocket! Shown below are 2 side by side comparisons of the NNGPC (on the left) and the NGPC (on the right). As you can tell, the NNGPC is smaller (thinner, mostly) than the NGPC. In fact, the NNGPC seems to be the exact same size as the original NGP (confused yet?). Just as a note...the NNGPC is only different in size. It does not have its own games, or anything like that. The Coming Soon section has been updated with listings for Ogre Battle and Metal Slug: 2nd Mission(!!). SNK's big announcement took place on the 6th in Japan, and now The Magic Box has reported what took place. The NGPC price drop that was reported last week, has been confirmed. The units effected by the drop are actually a new version of the NGPC, called "New Neo Geo Pocket". The "NNGP" is smaller and lighter than the original NGPC, but it is fully compatible with all previous units, software, and accessories. This new, cost-effective unit will be released in Japan on October 21st, the same day as many new titles such as Densha De Go! 2, SNK vs. Capcom CARD CLASH, and others. SNK is currently developing a KOF spin-off called King of Fighters Adventure, for both Dreamcast and NGPC. And yes, you gussed it...both versions will be linkable. SNK will be porting Quest's Ogre Battle to NGPC for release in March of 2000. It is sure to be a major hit. Many Neo Geo Pocket owners around the net, us included, have been wondering if it is wise to import the Japanese version of the Wireless Link, which was recently made available by various importers. Well, we've now learned that when the unit is released in North America, it will be altered from it's original version - tweaked to conform to FCC regulations (that's good thing). After learning this, we will now be waiting for the official North American release, to avoid possible complications with software or even other electronic equipment. The Links section has been updated with links to Swan Song, GNN, and Point Zero Animation. A quick note to let everyone know that Pacman, Biomotor Unitron, and Pocket Tennis Color have shipped to retail outlets and should be available NOW! Editor Torture recently purchased a copy of Biomotor Unitron, and is very pleased with the depth and quality of the game. Oh, and also keep an eye out for the retail releases of Neo Geo Cup '98 Plus, Puyo Pop, and Puzzle Link (known as Tsunagete Pon! to importers) - all of which are due later in the month. Today, the fine people at Gamefan posted some interesting news from Japan regarding a unit price drop, among other changes. ALSO, The Magic box posted a rumor today, stating that SNK will be making an announcement on September 6th, and this announcement could possibly be about a 3rd generation Neo Geo Pocket. What this might mean, should it be true, is anybody's guess. One thing that instantly comes to mind is the news that quietly surfaced earlier this year about a console-style Neo Geo Pocket Color featuring 2 detachable controlers. We will keep our eyes out for anything on this subject...but don't get too excited yet. In the September 1st issue of American news publication USA Today, the Neo Geo Pocket Color is actually reviewed, and receives a 4 star rating. They also went on to compare the superiority of the NGPC's graphical, control, and sound systems to that of the Gameboy Color. Thanks to Jay Levy for the info!